» What Does a Jay Z + Lil Wayne Collaboration Mean in 2015? It is possible that Wayne jumped the gun on an actual announcement of label-swapping, and that Bryant is covering for him until the news can be made official; Weezy has certainly been lobbing multimillion-dollar lawsuits at Cash Money for long enough for that to make sense. For now, though, this is about nothing more than another shot in the dark for Jay’s beleaguered streaming service. A bit deflating, to be sure. But even if Weezy and Hov had announced they were joining forces on the same label — even if they’d announced they were doing a joint album — even if they’d announced they were getting recreational pilots’ licenses together and starting their own niche airline catering exclusively to the Martha’s Vineyard–to–Hamptons route — it couldn’t help but feel, in 2015, a bit anticlimactic. For us wizened few who can still remember the heady hip-hop days of 2005, it’s little more than an echo of what once was. Because in the mid-2000s, every time these two crossed streams, it was a genuinely thrilling moment. When Wayne released his breakthrough album Tha Carter II at the end of 2005, Jay had been technically retired for more than two years. Wayne had slowly but surely worked his way past his early reputation as Cash Money’s token kiddie rapper. The growth, for those paying attention, was remarkable. But when he declared himself — on Side 1, Track 7 of TCII — the “Best Rapper Alive,” it seemed like calculated provocation. There were other, soon-to-be-eclipsed MCs who were hotter.2 Specifying “Alive” meant a direct blow to the brow of the dormant Young Hov. At that point in Wayne’s career, it was a preposterous, reckless thing to do — and all the more electrifying for it. In quick measure, he’d go about justifying himself. His legendary post–Carter II mixtape run has been lionized — but can you ever really say enough about it? Working off a particular swirl of prerolled blunts, promethazine, and a seemingly bottomless reservoir of raw talent, Wayne seemed to say something brilliant and unexpected every time he opened his mouth. They say style makes fights, and so here we had a good one. In one corner, there was Jay returning with his puffed-up comeback Kingdom Come, doing all he could to make it an “event” album. There was an EW cover, a tacky sponsorship with a major American beer company, and all manner of forced cultural immersion. In the other corner, there was Wayne, releasing — without any press push — mixtape after mixtape, track after track, verse after verse after verse. He gave it all away for free; he knew he always had more in the tank. And he couldn’t be bothered to wait for your response; he knew that what he had was gold. Earlier, he rhymed: “When it comes down to the recording / I must be LeBron James if he’s Jordan.” That was clear as can be. Without naming names, Wayne had taken his shot. Old man, have a seat. 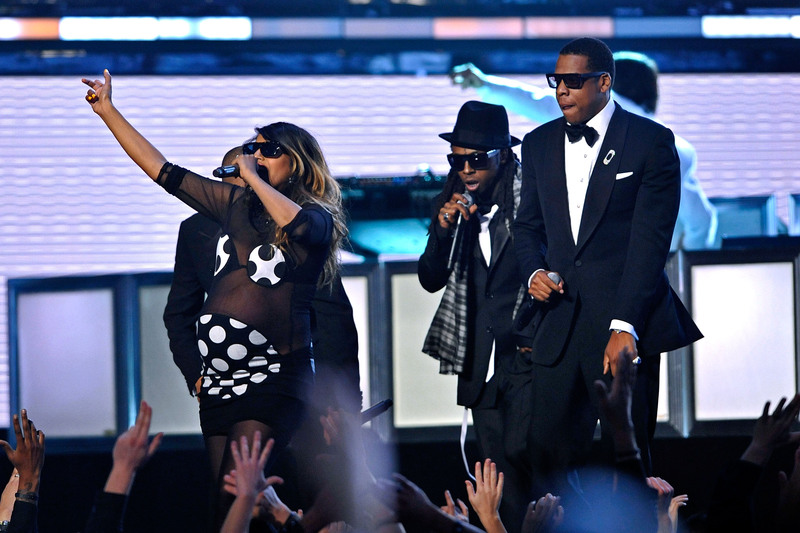 They had their most fruiful collaboration on the posse cut “Swagga Like Us,” a monster song that brought them to the Grammys with tuxes and a very pregnant M.I.A. They shared that indelible moment equally. Later we’d find out that Jay actually tried to sign Wayne. It didn’t work out — not because of any personal animosity, but because that was the natural order of the rap universe: In order for Wayne to take the throne, he had to force Jay out of his kingdom. In today’s parlance: In order to fulfill his greatness, Wayne had to get Jay out the paint. It’s something that doesn’t necessarily hold true anymore. Competition is too elemental to hip-hop. (Drake and Kendrick Lamar’s little tiffs come to mind.) But the monoculture doesn’t exist anymore. We’re not talking a monarchical lineage anymore; these days, everyone’s got their own little fiefdoms. If felt for a while like A$AP Rocky could have been Jay: the populist, devastatingly talented king of the world. It felt for a while like Kendrick was about to make his It Takes a Nation. Maybe they still will. But for now, they operate within their own domains. Kanye is the dominant voice of our generation. But at the end of the month, when Vince Staples drops Summertime ‘06, Staples will be — at least for that week — the most important rapper in America. That’s why it’s fun to get wistful about the old days of Jay and Wayne. Wayne was the evolution; he managed to make Jay look old and clueless. It had to be done. In a world where everyone’s got a corner, we may never have this kind of institutional, generational strife again. Nowadays, they’re both in the same vague post-peak period. Commercially, they can still headline arena tours and sell (relative) tons of records. But for critics — and, more importantly, kids — they don’t mean a shred of what they once did. They are dinosaurs, huge but passing. And their joint LLC, whatever it might be, has come years too late to truly matter. And for a brief moment, it really felt like the kings were back at it again. The Internet and the blogs. For one: Back then, you really couldn’t Ban the Snowman.